5% Helichrysum in a carrier oil (jojoba) solution. This 5% solution allows you to experience the aroma and healing properties of this wonderful oil at a fraction of the cost. Also known as Everlasting or Immortelle, helichrysum essential oil has a distinctive sweet, hay-like aroma. It is known for its anti-depressant qualities, helping to uplift the mind and spirit. Helichrysum essential oil is also excellent for pain relief, bruising, inflammation, scarring, arthritis and respiratory infections. As such, it has a multitude of uses: aches and pains, mature skin formulas, bruising, burns, scars, and more. 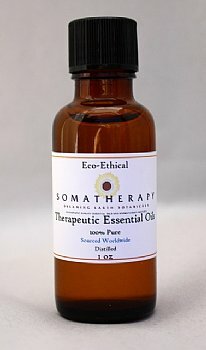 We keep a bottle of it handy for all sorts of uses -- it's one of our very favorite oils. For 100% Pure Helichrysum Essential Oil, click here. For more info on Helichrysum and how to use it, visit our blog post!